Stunning 1 Bedroom, 1 Bathroom Home! Walk To All The Happening Places!!! 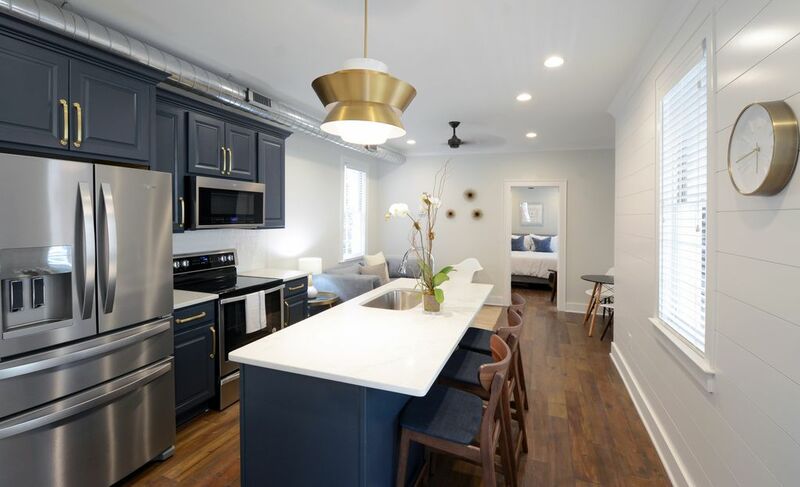 Recently renovated, brand new - this 1 bedroom, 1 bathroom home accommodates 2 guests. Brand new luxury linens and lush towels that are top quality are plentiful throughout the home. Hotel toiletries and hair dryers are provided in the bathroom . One, off-street parking space is provided allowing for convenient loading and unloading. The spacious living room has a flat screen TV as does the bedroom. There is a fully equipped kitchen with stainless steel appliances. We also have a large, fended-in private yard. Complimentary Basic Cable and WiFi. Concierge services are offered by Charleston Concierge & Luxury Property Management. This top notch concierge service will be happy to provide an array of services including but not limited to a private chef, dinner reservations, grocery/alcohol delivery, transportation, professional photography, baby equipment rentals, charters, event tickets, bike rentals and more! SHORT TERM RENTAL OPERATIONAL PERMIT # ____________ Concierge services are offered by Charleston Concierge & Luxury Property Management. This top notch concierge service will be happy to provide an array of services including but not limited to a private chef, dinner reservations, grocery/alcohol delivery, transportation, professional photography, baby equipment rentals, charters, event tickets, bike rentals and more! Lush towels. Tile. Stall shower. Walk to all the happening places on Spring, Cannon and Upper King Street! Flat screen TV in Living Room and Bedroom.